Hello, our beloved customer. 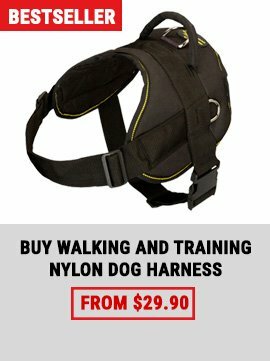 Good news for those who want to train his beloved pet with the utmost comfort. 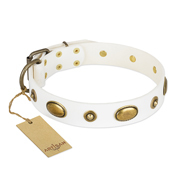 Moreover, it is a great offer for those who want their Great Dane to be always in fashion. There is nothing to be in for a surprise. We're talking about out Exclusive Brass Spiked Leather Great Dane Harness. Nowadays everything is possible. Are you doubt? In this case we advise you to read the information below. Most likely all your doubts will go up in smoke. 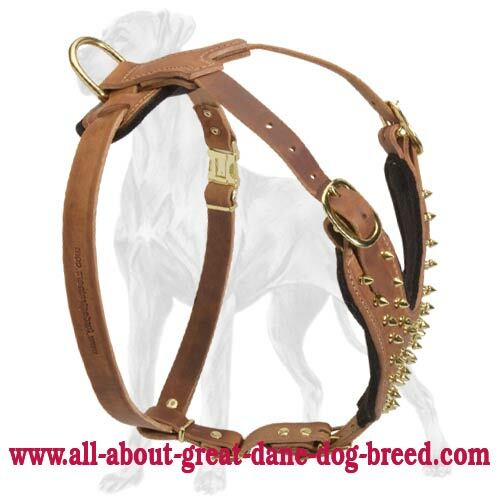 To start with, we’d like to tell you some advantage of this Amazing Spiked Leather Harness for Your Great Dane. 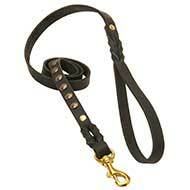 - This harness is made in accordance with international standards. Our craftsmen have used only high quality and non-toxic material. 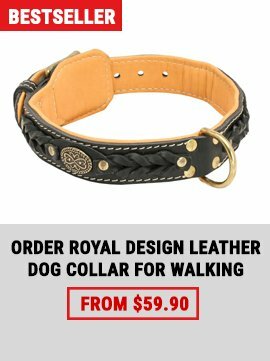 So this soft but strong leather is meant to serve you and your doggy for a long time. The harness will sit perfectly on your Great Dane. The harness is equipped with felt padding on the chest plate, wide straps and wide "Y" shaped chest plate. So he/she is protected from rubbing, skin irritation and cutting into skin. 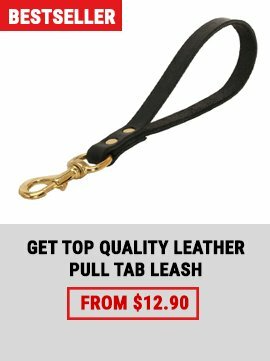 - The harness is comfortable not only for your four-legged friend, but for the owner as well.The secret is that the harness is 4 ways adjustable and has a quick release buckle. So you need to fasten this canine item only once according to your pet’s size. Then you’ll only use this quick release buckle. You see, it’s so easy now. - A glance from these shiny brass spikes may fall across your eyes. This rustproof decoration is hand set and riveted for extra durability. So the spikes won’t fall off. They will beautify your Great Dane. 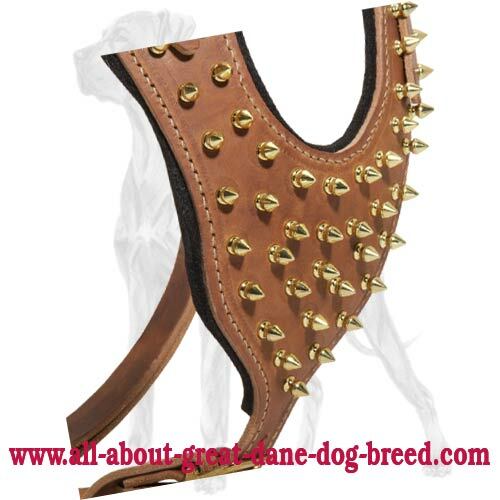 So whether you’re going to walk or to train your pet, this Perfect Decorated Leather Harness will become right hand both for you and your smart Great Dane, because this Y-shaped chest plate won’t restrict the movements of your doggy.